Biologist Joseph Grinnell was a world-class researcher, but he wasn't always the most pleasant of traveling companions. "We'd be sitting in camp, and we'd both be skinning," recalled naturalist Ward Russell, who spent years helping Grinnell trap, skin and otherwise document the wildlife of California. "Pretty soon, he'd throw a rat over to me, and he'd say, 'Here, Russell, finish this one up,' and he'd just ... pick up his notebook, and start writing." Despite his dubious camp etiquette, Grinnell's devoted record-keeping led to one of the most famous datasets in modern biology. During their travels throughout California between 1904 and the late 1930s, Grinnell and his colleagues snared or shot more than 20,000 mammal, bird, reptile and amphibian specimens, took about 2,000 photographs, and filled 13,000 journal pages with erratic penmanship and beautifully detailed observations. Their portrait of the natural diversity of California remains unmatched in its scope and depth. Grinnell, the founding director of the Museum of Vertebrate Zoology at the University of California at Berkeley, was by all accounts a dedicated, methodical researcher. His field journal, which he kept until just five days before his death in 1939, numbered more than 3,000 pages. He helped build the museum's store of animal skins and skeletons, an international collection now ranging from a hippo skull the size of an easy chair to shrew skeletons no larger than a thumb. Grinnell was interested in far more than simply cataloguing types and numbers of critters, what some modern biologists dismiss as "stamp collecting." His exacting protocols required collectors to not just record each find, but also to take detailed notes on the surroundings and the weather. Using these reams of information, Grinnell studied the intricate relationships between animals and their habitats, developing theories still taught in college biology courses. Yet in 1910, Grinnell predicted that the real value of his and his colleagues' painstaking fieldwork would not "be realized until the lapse of many years, possibly a century." Change was clearly part of the natural world, he wrote. But he also saw "vastly more conspicuous" transformations of the environment in the speedy deforestation, cultivation, and irrigation of the West. He believed that in the future, scientists would return to some of his more than 700 study sites, and use his findings to chart these changes. That future is now. On a gray August morning, nearly a century after Grinnell wrote those words, I shoulder a backpack on the east side of Yosemite National Park and set off into a light but steady drizzle. I'm not a scientist, but after years spent working and playing with biologists, I've acquired a secondhand sense of scientific curiosity. This hike is a welcome chance to indulge it. Stored in my increasingly soggy pocket are two maps. One, a reproduction of a map drawn in 1915 by Grinnell's colleague, Charles Camp, has so many elegant squiggles and crosses that it looks like a map to buried treasure. The other, a slice of topographic cartography showing the same terrain, was e-mailed to me just a few days earlier by one of Grinnell's intellectual descendants. In the time between these maps, startling things have happened in Yosemite, and so far, their causes are largely unacknowledged by the National Park Service. Just as Grinnell foresaw, his data are providing valuable evidence of conspicuous change in the natural world. But even the prescient Joseph Grinnell didn't count on global warming. I hike up a long, gently sloping glacial valley, the miles quietly unrolling behind me. I'm so distracted by the toothy granite peaks ahead, and the glassy creek beside the trail, that I hardly notice the worsening weather. By mid-afternoon, when I reach the cluster of tents that form the modern-day Grinnell camp, the morning's showers have turned into a cold, soaking downpour. I gratefully peel off my clammy raingear and don the first dry clothes I'm handed — which turn out to be a pair of Jim Patton's pants. Patton, the curator of mammals at the Museum of Vertebrate Zoology and a retired Berkeley professor, doesn't seem fazed by our unusual introduction, the terrible weather, or much else. A wiry man with a booming voice and ready laugh, Patton has spent much of his career in Latin America, where he discovered several new species of rodents and other creatures, and had a genus of speckled tree rats named in his honor. For the past week, the Pattons and Les Chow, a wildlife biologist with the U.S. Geological Survey, have been working near the head of Lyell Canyon. Their camp, sheltered by a thick stand of square-browed whitebark pines, sits just below Lyell Glacier, the largest glacier in Yosemite. On the afternoon I arrive, the valley is cloaked in clouds, but it still offers what the peripatetic John Muir called, in an 1890 description, "a sublime and finely balanced picture." Several researchers have mined the Grinnell data during the past nine decades — herpetologist Gary Fellers used it in the early 1990s to document a dramatic decline in amphibians in the Yosemite area — but no one has ever attempted a broad resurvey of the sites. Now, Jim Patton and other researchers associated with the Museum of Vertebrate Zoology, inspired by Grinnell's writings, hope to revisit about a third of the California sites by the museum's centennial in 2008. 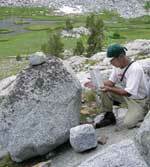 With funding from the Geological Survey and the Yosemite Fund, a nonprofit organization that supports research in the park, biologists began in 2003 to study 40 sites along Grinnell's "Yosemite Transect." The morning after I arrive in camp, our group awakens to clear blue skies and a dusting of snow on the highest peaks. We're not the first to shiver through the night here: "This north slope of Mt. Lyell must be one of the coldest places in California," Grinnell associate Charles Camp grumbled in his 1915 field journal. 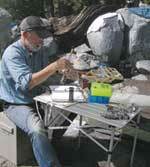 The current work in Lyell Canyon is, in many ways, a deliberate re-enactment. I follow Les Chow as he checks a long row of mammal traps on a nearby talus slope, just as the Grinnell team did here each day. I watch Jim Patton skin a few unlucky specimens with a small pair of scissors, then record his findings and observations using the exacting Grinnell method. Patton even stores his trays of animal skins in the same scuffed crates once used by Grinnell and his colleagues; the wooden boxes, originally designed to carry cans of lard, have survived a century of nearly constant use. For Patton, the project is also a journey into his scientific heritage. Grinnell and his colleagues often wrote down their musings about the natural world, and Patton sometimes dips into their journals during his days in the field. Grinnell pondered the flocking behavior of redwing blackbirds, and wondered how birds responded to the roar of the waterfalls in Yosemite Valley. Charles Camp, one Sunday in 1915, proclaimed that "The Lord hath sent us a wolverine," and made careful sketches of the animal's head and paws, asking in a marginal note if its feet were webbed for walking on soft snow. These voluminous notebook entries, with their imperfections, their detours, and their moments of clarity, exude the excitement of discovery. "To be at the same spot, the same rock outcrop, and to be able to read what they were seeing and thinking ..." Patton shakes his head. "The only reason we have this opportunity is that Grinnell was fanatic about what he did." Field science has changed a bit since the days of Joseph Grinnell. In the Lyell Canyon camp, we eat rehydrated dinners out of foil packets instead of cooking on an open fire, and we eschew worsted wool in favor of Gore-Tex. Some researchers store their Grinnellian journals on Palm Pilots, instead of in the traditional lined looseleaf notebooks. And while Grinnell used stacks of "museum specials," a sort of burly mousetrap, to break the backs of tens of thousands of small mammals, Patton and his crew now trap their subjects alive in slim aluminum boxes, often releasing them unhurt. 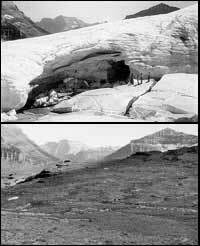 But the most significant difference between the old and new Grinnell expeditions lies inside the traps. When Patton first visited Lyell Canyon in 2003, he opened one of his aluminum boxes to find a small mouse with remarkably large ears. "I thought, 'What the heck is this thing doing here?' " says Patton. "I was dumbfounded." Its huge ears immediately introduced it as a piñon mouse, which, as its name suggests, is a familiar resident of the lower-elevation piñon pine forests of the Sierra Nevada. On the east side of the Sierra, Grinnell and his assistants only saw piñon mice below 7,000 feet, a finding confirmed by other researchers throughout the central part of the range. Patton's group found numerous mice frolicking in the talus slopes of Lyell Canyon, 10,200 feet above sea level and about eight miles from the nearest Grinnell sighting. The distance was too great to be the work of just a few wandering individuals; it was clear to Patton that the range of the piñon mouse, and its habitat, was far different now than in 1915. "They're common, and they're easily identified," says Patton. "If they had been up here before, (Grinnell and his compatriots) would have seen them." The new Yosemite crew uncovered more changes. Four other small mammals have expanded their turf in the park, increasing the upper limits of their ranges by an average of 2,000 vertical feet. 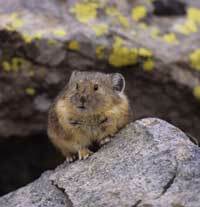 The alpine chipmunk, two high-elevation ground squirrels — including the Belding's ground squirrel, known as the "picket pin" for its ramrod-straight alarm posture — and a small relative of the rabbit called the pika have retracted their haunts uphill, drawing in the lower edge of their ranges by an average of 1,700 vertical feet. At least two species of small mammals, a chipmunk and a woodrat, have dramatically shrunk the overall size of their ranges, and are now extremely rare in the park. Ornithologist Andrew Rush, who recently revisited the Grinnell sites in Yosemite, also saw and heard some surprises. In Lyell Canyon alone, he recorded 17 bird species not mentioned by the Grinnell team, many of them riparian and wetland species more familiar at lower elevations. Some of these species, such as the blue-winged teal and the mallard, were even breeding in the canyon's high-elevation meadows. The Grinnell survey and resurvey represent just two snapshots in time, and what happened in the intervening years is largely unknown. But studies of particular species in the area help fill in the gaps, and confirm that neither Grinnell nor his modern followers witnessed a fleeting anomaly. So what's going on in Yosemite? Fire suppression, with its transforming effects on habitat, has certainly played a part in the rearrangements of wildlife at lower elevations. 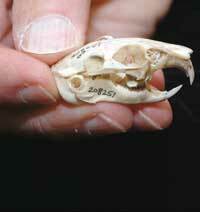 It may also explain why a couple of small mammal species moved downhill in the park, defying the overall trend. Yet in alpine areas such as Lyell Canyon, Grinnell photographs from 1915 show that its forests and meadows looked almost the same as they do today. There is little question, however, that the entire park is warmer than it was during Grinnell's time. Snow is melting earlier in the spring, and Lyell Glacier, like other glaciers throughout the Sierra, is disappearing. Researchers at Portland State University found, using another series of historic photographs, that the surface area of the western lobe of Lyell has shrunk 30 percent since 1883, and the eastern lobe has contracted 70 percent. Weather records from Yosemite Valley show a 9 degree Fahrenheit increase in mean minimum temperatures over the past century. Though weather data from higher elevations are spotty, Museum of Vertebrate Zoology researcher Robert Hijmans estimates that mean minimum temperatures throughout the central Sierra rose 5 degrees Fahrenheit over the last 100 years. The vast majority of scientists say humans have a lot to do with such changes, which are now observed around the world. They say the rising concentration of carbon dioxide and other greenhouse gases in our atmosphere — due in large part to cars, coal-fired power plants, and other human inventions — bears significant blame for the planet's warming climate. In high, relatively undisturbed places such as Lyell Canyon, these rising temperatures — and their various effects on the landscape — are the most dramatic changes in the environment over the past century, and they are the most obvious explanation for the shifting alpine wildlife of Yosemite. For some species, it appears, just a few degrees' difference in temperature makes home uncomfortable, and previously inhospitable habitat more welcoming. "For the pika, the alpine chipmunk, and the Belding's ground squirrel, I don't know what else to link it to, other than climate change," says Patton. Back at the Museum of Vertebrate Zoology, museum director Craig Moritz agrees. "This is a work in progress," he cautions, "but my gut feeling is that we've got a whopping climate change signature." Thus the legacy of Joseph Grinnell survives, informing a new world. "Grinnell was one of those classic early ecologists that snobby scientists, towards the end of the 20th century, would dismiss as 'descriptive,' " says Raphael Sagarin, a researcher at the University of California at Los Angeles who uses historical datasets to study the effects of climate change. "Now we are seeing how important good descriptions of nature really are." On the trail in Yosemite, I meet a pair of hikers, and I mention what the Berkeley researchers are seeing — and not seeing — in the park. One shrugs. "Things change, man," he says. "That's just the way it is." In one sense, he's right. But never before have things changed in quite this way, for quite this set of reasons. Never before have human activities shoved entire communities of animals uphill, causing eerily consistent shifts across huge and varied landscapes. On another stormy summer evening, back in the buzz and crackle of civilization, I listen to ecologist Camille Parmesan unsettle a crowd. She tells her audience, gathered at an environmental center in Aspen, Colo., that five species of tropical butterflies have just been recorded in Texas, and some are trying to breed as far north as Austin — about 700 miles north of their usual range. "They cannot handle a freeze," says Parmesan, a professor at the University of Texas at Austin, as she describes a strictly tropical group of species known as clearwings. "It's very bizarre to be seeing them up in Texas." Butterfly populations are making similar northward leaps in California and throughout Europe, she reports. Meanwhile, several species of tropical dragonflies have moved northward into Florida, and southern Louisiana now has several dozen permanent populations of rufous hummingbirds, a species that once only visited in the summer. Many species have also disappeared from the southern and low-lying parts of their ranges. The plants they depend on may now dry up too early; false springs may destroy vulnerable populations; or several subtle effects of warming temperatures may combine to drive animals out, or simply kill them. For instance, many low-elevation populations of pikas, the alpine rabbit relative, have disappeared in the Great Basin during the past 80 years. Such local extinctions can crunch a species' overall genetic diversity, making it more vulnerable to disease and habitat shrinkage. Consider the Quino checkerspot butterfly, now on the endangered species list. It appears to have lost the southern end of its range, in the Mexican state of Baja California, to global warming, while habitat in its northern haunts, in and around San Diego and Los Angeles, has been largely erased by urbanization (HCN, 11/10/03: San Diego’s Habitat Triage). "This is what has conservation biologists worried," says Parmesan. "It's the combined effects of climate change pushing things to want to shift around the globe, and human habitat destruction ... preventing that movement." Shifting species can also make life difficult for their new neighbors. The red fox of northern Canada, which moved its range 600 miles northward in just 30 years, now threatens to outcompete the smaller, less aggressive Arctic fox. In the cloud forests of Costa Rica, toucans recently shifted to higher elevations, where they jostle the quetzal — an emerald-feathered bird dependent on cloud forest habitat. In all of these cases, changes in habitat - logging, farming, urbanization, and the like — likely play some part. But the breadth and strength of the overall trend is undeniable, and that trend clearly indicates that rising temperatures are at work. Parmesan, who co-authored a 2003 analysis of existing studies in the scientific journal Nature, estimates that biologists have now collected "good quality data" on the effects of climate change on more than 1,500 animal and plant species. Half those species have clearly shifted upward or northward in recent decades, and two-thirds are breeding earlier in the year. Only a handful are moving to warmer climates, or breeding later. Stanford University biologist Terry Root, who led a similar analysis of the field in 2003, reports that a consistent "fingerprint" of global warming is perceptible on species "ranging from molluscs to mammals and from grasses to trees." Even if we quit adding greenhouse gases to the atmosphere tomorrow, the planet would continue to warm up. Researchers at the National Center for Atmospheric Research in Boulder, Colo., call it the "climate change commitment": What we've already pumped into the atmosphere will cause global air temperatures and sea levels to rise, slowly but significantly, over the next several centuries. Every day of new emissions commits us to yet more warming, and deeper waters. The Intergovernmental Panel on Climate Change, considered the global scientific authority on the subject, foresees that between 1990 and 2100, the earth's average surface temperature will increase by between 2.5 and 10.4 degrees Fahrenheit. "The projected rate of warming," the panel concluded in its most recent report, "is much larger than the observed changes during the 20th century, and is very likely to be without precedent during at least the last 10,000 years." Yosemite National Park, like all our national parks, is supposed to muffle these and other "vastly more conspicuous" transformations wrought by humans, to use Joseph Grinnell's words. "It would seem to me that national parks should comprise pieces of the country in which natural conditions are left altogether undisturbed by man," Grinnell wrote to Yosemite Superintendent W.B. Lewis in 1920. Yet the modern-day Grinnell team has found that when it comes to global warming, Yosemite is no refuge. "Places like Yosemite mean so much to so many people," Jim Patton reflects. "People think we've preserved this piece of the environment, but we haven't. The high-elevation species, those that seem to be retracting upwards, have no place to go — so when they go, they're gone, and they're never coming back." How do we respond to such dire forecasts? Protecting more land in more diverse habitats is the obvious answer, so that as the earth warms, affected animals will have more places to go. The Nature Conservancy's Global Climate Change Initiative, for example, is researching the current and future impacts of climate change on wildlife and habitat, with an eye to incorporating its findings into conservation planning. But turning theory into reality is expensive, and politically tricky. While many land trusts and other conservation groups are working to connect existing reserves with corridors of protected habitat, there are as yet few — if any — natural areas intended specifically to cushion the effects of global warming on biodiversity. What's more, some already protected areas are hemmed in by development, making it difficult for them to expand. For the most part, managers of existing parks and reserves must work within their boundaries, and when it comes to a global problem like climate change, that's a frustrating proposition. Parks certainly can't put the brakes on climate change by themselves, and they can't grow their mountains to create more habitat for pikas. Some park researchers and managers, including David Welch of Parks Canada, suggest that parks dedicate themselves to reducing other stresses - invasive species, or haze, or human impacts — in hopes of buffering the effects of climate change on wildlife and habitat. Others advise transplanting species, or working with other land managers to protect habitat corridors. "I think it's going to take a lot of thought," says Kathy Jope, chief of natural resources for the Pacific West region of the Park Service. "There's a lot of uncertainty about exactly what we should do." She points out that moving a few animals won't preserve an ecosystem, and that exotic species travel corridors, too, often more quickly than their native competitors. Clever solutions have an irritating habit of leading to new problems. One thing that national parks can do is fire the public imagination. "Parks are treasured icons," says Welch, who is helping devise a climate-change adaptation strategy for Canadian parks. "There's a lot we can do with outreach and education." Yet in the United States, park officials are often loath to speak openly about the effects of global warming on their own resources. "Scientists, naturalists and educators in every park are facing it, and they see that it's really powerful and inescapable," says one park official, who asked not to be named. "But parks have to be very subtle in how they approach these things. The biological reality we see around us, and the reality the (Bush) administration sees, do not come together very well." The Bush administration has long emphasized the uncertainties inherent in climate change research, and opposed any mandatory controls on greenhouse gas emissions. Though President Bush did say, just prior to the Group of Eight Summit in Scotland in July, "I recognize that the surface of the Earth is warmer, and that an increase in greenhouse gases caused by humans is contributing to the problem," the administration's position on emissions controls has not changed. Many park staffers fear the consequences of undercutting this position, even indirectly. Though park staff say they have not received specific instructions from the top on global warming, the president is, after all, their boss, and many feel their words and actions are scrutinized. "I've never seen an administration that's extended its reach so far down in the system," says the unnamed official. By 2030, scientists predict, even the largest glaciers at Glacier National Park will be gone; you may live to hike in a glacierless Glacier. But the park still provides little information to the public about the known causes and effects of climate change. "We've had visitors ask, 'Why aren't you saying more about global warming?' " says Leigh Welling, director of the park's Crown of the Continent Research Learning Center, "and I think that's a fair question." Even in the face of mounting scientific evidence, some park officials are reluctant to fully acknowledge the issue. "How possible climate change could impact the park's resources is still unknown," says Niki Nicholas, chief of resource management and science at Yosemite. "Will temperatures be higher or lower, in which places, and in which time of year? Those questions are all unanswered." In place of an emphatic and straightforward message about global warming, national parks have the Climate Friendly Parks program, a modest joint effort of the Park Service and the Environmental Protection Agency. With a $200,000 annual budget and the part-time attention of three Park Service employees, the program encourages parks to voluntarily reduce their own greenhouse gas emissions and educate the public about their efforts. Many parks, including Yosemite, have adopted some energy-efficient technology, perhaps hoping that fleets of hybrid buses and arrays of solar panels will quietly inform and inspire their visitors. Some parks are beginning to talk plainly about the impacts of global warming, but their approach remains cautious. Glacier is revising its "messaging" on climate change, and plans to make more detailed and explicit information available to visitors. In Sequoia National Park, a forthcoming visitors' center exhibit will discuss global warming's implications for the park. "We don't try to tell people what will happen," says Sequoia chief of interpretation Bill Tweed, "but we do ask them to ponder what might happen." Michael Soukup, Park Service associate director for natural resource stewardship and science, gingerly endorses these efforts. "I believe that the science is fairly clear, and the last I heard about the politics of it, everyone was willing to agree that there was change afoot," he says. While the degree of humanity's contribution to climate change is still up for debate, he adds, "It'd be nice for park visitors to hear a clearer message that we need to be careful in our energy consumption and efficiency." But for the Park Service, facing climate change also means facing a fundamental quandary. Back when Congress created it in 1916, the agency was charged with protecting park resources, including wildlife, "unimpaired for the enjoyment of future generations." Climate change is looking more and more like an unavoidable impairment. "For traditional parks, those that preserve large amounts of biology, climate change challenges the mission we've had since year one," says Bill Tweed. "We're not going to save it all - I don't see how that's possible. So what is our mission?" There are no easy answers. Change is surely constant in nature; even the most casual visitor to Yosemite accumulates stories about lightning and rain and soggy gear, and stands awed before the work of glaciers and wildfires. But global warming is a far different, and much stranger, creature, one that threatens the very nature of the national parks themselves. Perhaps part of the new mission of the Park Service is to speak openly about this exceptional change — to talk about why the piñon mouse is no longer really a piñon mouse, and why the pika is running out of room. In the 90 years since Charles Camp drew his map of Lyell Canyon, Yosemite has changed in ways he could not have imagined. Thanks to the work of Joseph Grinnell and his colleagues, the Park Service can now explain why. Michelle Nijhuis, HCN's contributing editor, writes from Paonia, Colorado. This story is funded in part by a grant from the Engel Fund of the San Diego Foundation. Is anyone home at the parks?